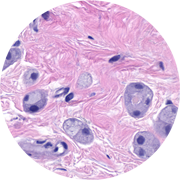 A 78 year-old-woman with a history of left breast cancer presents with a right breast mass. Core biopsy of the right mass shows fibrocystic change characterized by papillomatosis and densely fibrotic stroma. Scattered haphazardly in the background are primarily single cells and occasional small clusters of cells with lumen formation. The cells demonstrate bland nuclei, single small nucleoli, and abundant granular cytoplasm. There is no desmoplasia. Immunostains show that these cells are positive for Cam5.2, E-Cadherin, and estrogen receptor. The biopsy was diagnosed as highly suspicious for invasive ductal carcinoma. Follow-up lumpectomy contained an 8 mm focus of the same worrisome lesion which was seen in consultation by Johns Hopkins and definitively diagnosed as infiltrating ductal carcinoma, well differentiated, with histiocytoid features.